"I think art is a total thing. A total person giving a contribution. It is an essence, a soul.. In my inner soul art and life are inseparable." 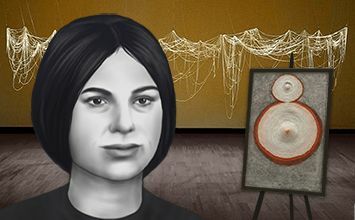 Eva Hesse is one of the most renowned American artists to come of age in the immediate aftermath of The Abstract Expressionists. Having fled her native Germany during the rise of Nazism, Hesse was originally schooled in American abstract painting and commercial design practices. She originally pursued a career in commercial textile design in New York City, but Hesse's practice as an expressionist painter led her to increasingly experiment with industrial and every-day, or "found" materials, such as rope, string, wire, rubber, and fiberglass. Reducing her means in the spirit of Minimalism, Hesse explored by way of the simplest materials how to suggest a wide range of organic associations, psychological moods, and what might be called proto-feminist, sexual innuendo. She also experimented with expressing semi-whimsical states of mind rarely explored in the modern era until her all-too-brief debut. Thus Hesse arrived quickly at a new kind of abstract painting, as well as a kind of so-called "eccentric," freestanding sculpture. Professionally trained as an abstract painter and commercial designer, Hesse is a paradigmatic postwar American artist, much like Ellsworth Kelly, who regarded painting not as a two-dimensional surface, but as an object on the wall to be extended into the space of the viewer before it. Mimicking the organic vulnerability of the human body itself, work by Hesse seems to take on a tentative or even ephemeral life of its own, its material density apparently enlivened by some invisible, psychological momentum. Much of Hesse's work might be thought of as a form of poetic, three-dimensional montage, a conjoining of disparate parts culled from diverse sources and combined, or arranged in ways that suggest moments of quiet reflection on the world around us. Hesse's life was plagued by various kinds of physical and emotional hardship, ranging from political persecution to familial illness and depression, not least of all her eventual suffering and demise from cancer. Nevertheless, Hesse boldly forged ahead and made the most of her professional circumstances, ultimately to create abstract and endlessly evocative works free of any socio-political agenda. Hesse was among the first artists of the 1960s to experiment with the fluid contours of the organic world of nature, as well as the simplest of artistic gestures. Some observers see in these qualities latent, proto-feminist references to the female body; others find in Hesse's languid forms expressions of wit, whimsy, and a sense of spontaneous invention with casually found, or "everyday" materials - approaches that show the diversity of Post-Minimalist practice. 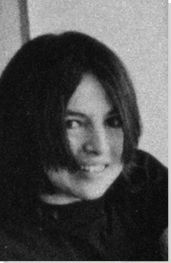 Eva Hesse was born into a German-Jewish family during the social and political turmoil brought about by the rise of the Nazi regime in Hamburg. Family life under the Nazis was difficult for the Hesses; Eva's father, Wilhelm, was barred from his law practice, and mother, Ruth, frequently suffered bouts of depression. Intent on keeping their children safe after the November pogrom of 1938 ("Kristallnacht"), Eva and her sister Helen were sent to a Dutch children's home. The family was later reunited in England, from where they made their way to the United States. Interactive chart with Eva Hesse's main influences, and the people and ideas that the artist influenced in turn.